Matrikx +Pb1 is a powerful, multifunctional filter cartridge for residential and commercial water treatment systems. 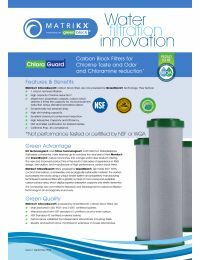 Manufactured with KX's proprietary extrusion process, Matrikx +Pb1 filters offer high levels of chemical reduction in potable drinking water, including chlorine taste and odor. Matrikx +Pb1 filters consist of activated carbon particles fused into a uniform block with enhanced absorptive capacity and efficiency. This extruded activated carbon filter reduces soluble lead using an ion-exchange filter medium with high specificity for soluble lead. Particulate filtration is used to intercept insoluble lead-containing particles. The filter flows in a radial (outside-to-inside) direction, providing increased dirt-holding capacity and low pressure drop. Matrikx CTO filters, powered by GreenBlock, are made from 100% coconut shell carbon, a renewable, and ecologically sustainable material. The carbon is processed into blocks using a unique binder system and proprietary manufacturing techniques to produce filters with a greater number of micro-pores and available carbon surface area, which display superior adsorption capacity and kinetic dynamics.